Will Regulators Soon Be Sending a New Message to Messaging Companies Like WhatsApp and Facebook Messenger When It Comes to Real-Time Communications? Blog Will Regulators Soon Be Sending a New Message to Messaging Companies Like WhatsApp and Facebook Messenger When It Comes to Real-Time Communications? Communications Service Providers (CSPs) have been playing defense for nearly a decade now, as challengers in the over-the-top messaging space have grown dramatically, attracting billions of users and driving massive enterprise valuations. It doesn’t seem fair that the CSPs, otherwise known as “telcos” and “network operators” have spent decades investing in network infrastructure and messaging services to support global communications, only to have their Internet assets leveraged by software companies whose applications ride on their networks while at the same time diminishing their brands and revenue-generating services. Regulators have scrambled to figure out how to balance this equation, as they have held the traditional providers responsible for complying with local and national regulations, but have had little control over what companies using network infrastructure including access to the Internet are providing as web-based, browser-enabled instant messaging services. Even as this complex matter is being debated and eventually resolved, some CSPs have already taken action and regained some control by developing and rolling out competitive messaging applications and services, enriched with their natural assets (billing and operating systems, presence-sensitive technologies, and most of all their brands) to appeal to consumers to stay “on-net” for better experiences, also “for free,” but with premium extensions. 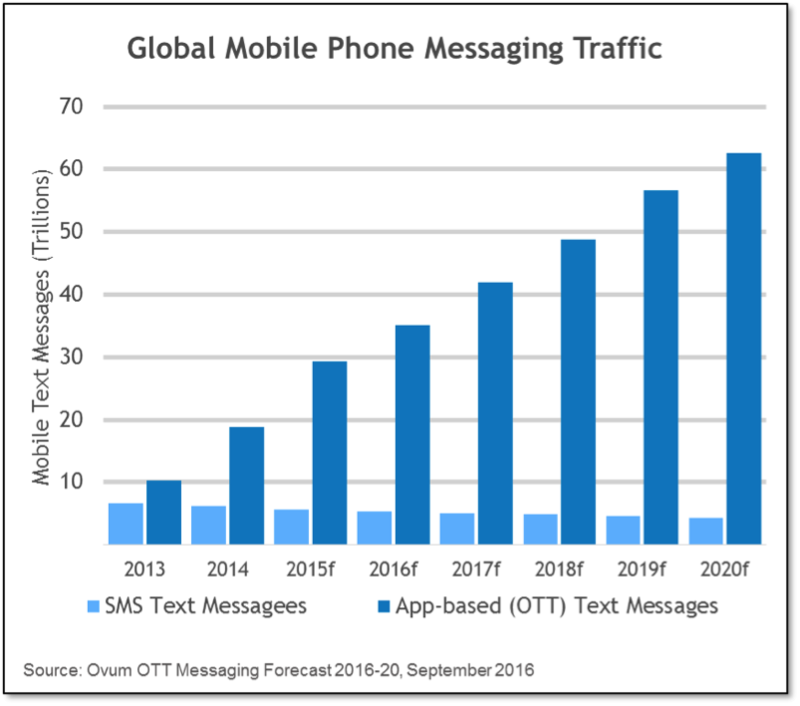 Here’s a quick view of how messaging apps have grown over the last several, strategically important years. In September, The European Union’s executive arm proposed that online messaging services like Skype and WhatsApp be subject to some of the same rules that have regulated traditional CSPs. Then, in late October, European privacy regulators subsequently sent letters to Facebook’s WhatsApp and Yahoo, expressing concerns about possible violations of the bloc’s data-protection rules. An EU consortium comprising national data-protection authorities from the bloc’s 28 states said it sent WhatsApp a letter expressing “serious concerns” about the messaging service’s new terms that allow it to share user information including phone numbers with its parent, Facebook. The regulators forcefully asked Facebook to cease sharing data until “legal protections” could be put in place to protect consumers. The bloc’s letter to Yahoo laid out concerns about a 2014 data breach the company announced in September, as well as allegations that the company scans customers’ incoming emails at the request of U.S. intelligence agencies, which Yahoo vehemently denies. Consumer protection and privacy advocacy groups from around the world are continuing to organize, as well as governmental groups including Germany’s Federal Cartel Office (investigating whether Facebook abuses its dominance as a social network to extract personal information for their own benefit, for example selling that information to advertisers) and France’s privacy watchdog, which has threatened to fine Facebook if it doesn’t change how it handles data about its users. The EU bloc’s statements said that because WhatsApp’s policy change includes conditions that didn’t exist when current users signed up, many users have not given consent. The pressure is working. In mid-November, WhatsApp temporarily stopped sharing data of European users with Facebook a week after doing the same in the UK on the request of the Information Commission. Based on articles in the media, following conversations with European officials, WhatsApp will only use data needed for administrative purposes, giving regulators a chance to come to an agreement with Facebook. “We hope to continue our detailed conversations with the UK Information Commissioner’s Office and other data protection officials, and we remain open to working collaboratively to address their questions,” the Financial Times quoted Facebook as saying. WhatsApp and Yahoo could be subject to oversight from national regulators on network security. Skype may be required to offer emergency calling services for European customers. Number portability is another potential requirement – Skype could be required to let users take their assigned numbers with them if they wish to move to a different provider. The proposals are still in flux, but what is clear is that the EU is finally acting on initiatives from the traditional telco industry to “level the playing field” to stem the losses they are experiencing in trying to compete with “free.” In addition, these same industry leaders are asking for relief on very specific regulations they spend billions of dollars to comply within, particularly associated with user privacy. These proposals could take years to convert into action and adoption. While the competing services like Skype, WhatsApp, Snapchat and others help consume data and therefore drive data revenue for the CSPs, the net result is software and cloud-based innovators getting the “cream” off the top of expensive and regulated network infrastructure. Meantime, in the U.S., the debates rage on as the incumbents and challengers weigh in on net neutrality and the really BIG question of BIG DATA and analytics and who will ultimately profit from the information both sides collect on the behavior of their subscribers. The software and cloud challengers argue that oversight in the U.S. and EU could become expensive juggernauts which consumers will ultimately pay for, as will shareholders in these companies. The costs to conform with heavy regulation will hamper innovation and restrain growth from consumers and businesses who rely on affordable, open and intuitive messaging. “You could see these cheaper calling options and video options disappearing from the markets,” said James Waterworth, vice president for Europe at the U.S.-based Computer & Communications Industry Association, a lobby group that represents Microsoft, Facebook and Alphabet Inc.’s Google (according to an article in the Wall Street Journal). We cannot forget another important part of the regulation, outside the economics. Lawful access rules, enabling wiretaps, are part of the regulations of the incumbents today. This very sensitive, complex and important conversation is critical in an era where terrorism is impacting communities around the world. Lawful access is required and incumbents spend massive amounts of money developing and managing this in order to help protect the public. We’ve seen in the news the challengers pushing back on providing governments windows into the messaging activities as part of their mandate to protect user privacy. Just the legal fees alone involved in working through this issue are manifold. While the European Commission continues its extensive work on reforms to its 15-year-old set of telecom regulations, CSPs are not standing still. They are now rolling out their own services with better features, more integration with the Public Switched Telephone Network (PSTN), and opportunities to monetize services through creative programs including embedded advertising, payments, and more. They are also using their natural advantages to deliver better quality experiences, better voice calls, faster and more secure messaging, high quality video experiences, and more. Can the incumbents win the war on both fronts? It’s not that simple, but the best strategy may be simply bringing services to subscribers that are better than the alternatives.